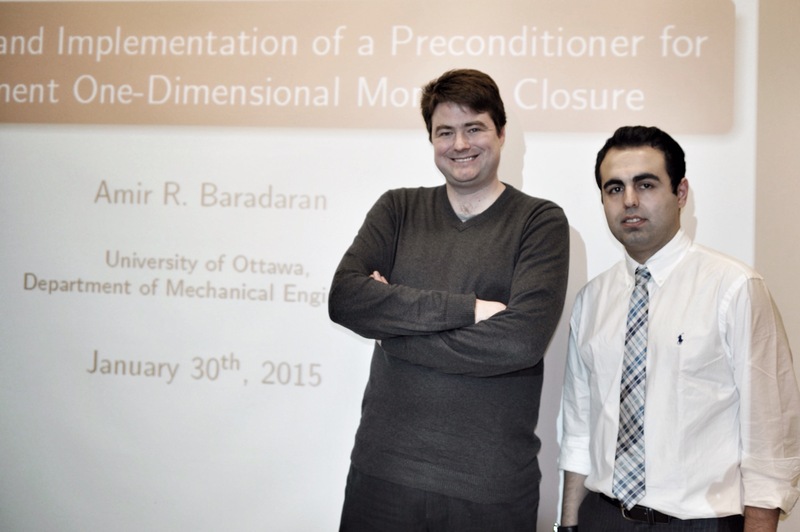 Amir presented his MASc thesis work last Friday on “Development and Implementation of a Preconditioner for a Five-Moment One-Dimensional Moment Closure”. Supervisor Dr James McDonald was on hand for the presentation. Traditionally, the Euler or Navier-Stokes equations are used to describe the time-evolution of a gas in the continuum regime. However, when a gas leaves the continuum regime and non-equilibrium effects become significant, neither of those two models produce physically accurate predictions. Recently, a new system of first-order hyperbolic partial differential equations (PDEs) was proposed for the treatment of monatomic gases that is valid both in and for significant departures from local thermal equilibrium. In this study, the resulting system for a one-dimensional gas is studied. It consists of first-order hyperbolic PDEs. The numerical computation ofvthe system has proven to be difficult since, for some realistic states, the closing flux of the system becomes infinitely large. 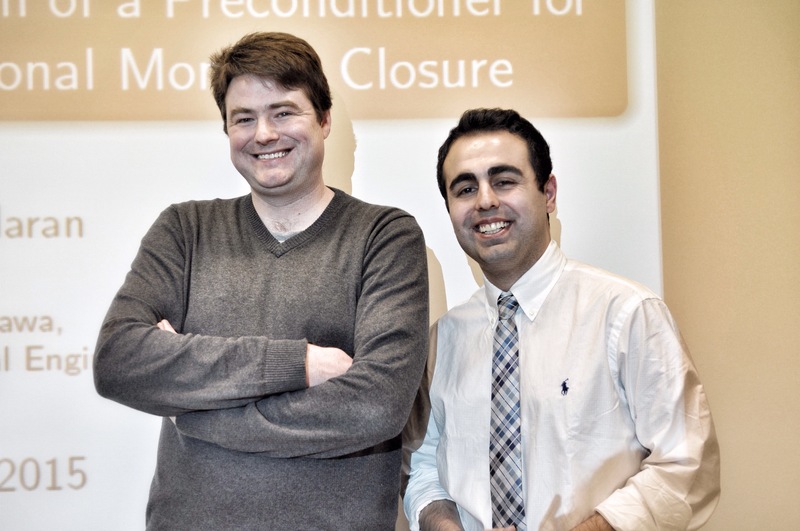 In the present study, the technique of preconditioning is used to develop a preconditioner for the system to scale the closing flux in order to remove the infinity from the system without altering the solution of the system in any way. A numerical implementation of the preconditioned system is described. Numerical solutions of several continuum and non-equilibrium flows problems are shown. Comparisons are made with other classical models.